The most basic question everyone faces in life is Why am I here? What is my purpose? Self-help books suggest that people should look within, at their own desires and dreams, but Rick Warren says the starting place must be with God and his eternal purposes for each life. Real meaning and significance comes from understanding and fulfilling God’s purposes for putting us on earth. 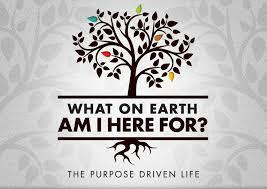 The Purpose-Driven Life takes the groundbreaking message of the award-winning Purpose-Driven Church and goes deeper, applying it to the lifestyle of individual Christians. This book helps readers understand God’s incredible plan for their lives. Warren enables them to see the big picture of what life is all about and begin to live the life God created them to live.